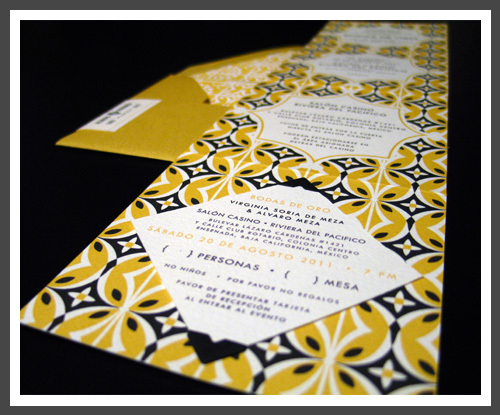 I shared the creation of a few Mexican tile-inspired patterns here and the final designs I would use for my in-law's 50th anniversary celebration invitations here, but below are the images I shot of the final invitation sets which were mailed to the guests a few weeks ago. 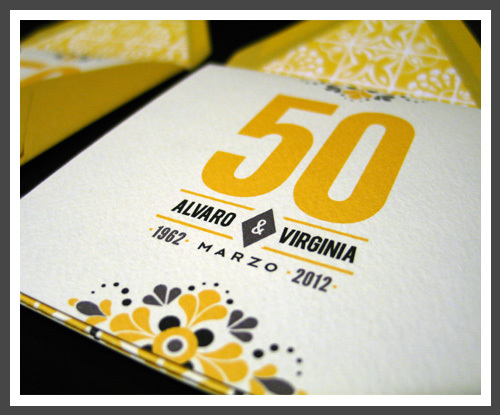 Their actual anniversary isn't until next March, but the celebration will be in a few weeks. 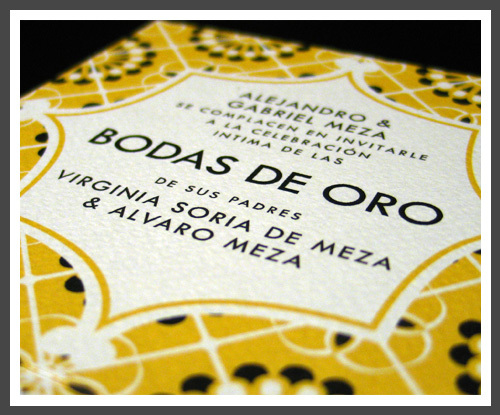 A logo with their names and wedding years was created to be used on the front of the invitation and address label. 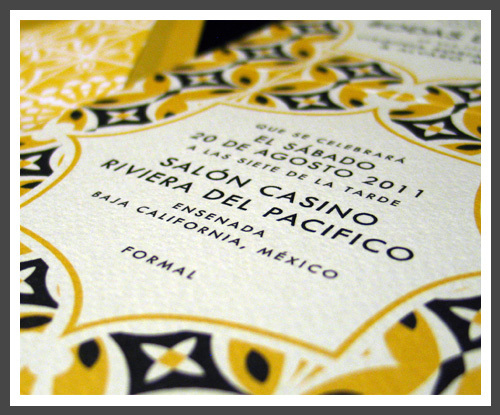 A different motif was created as well with the celebration date to be used on the back of the invitation and many of the other paper pieces such as favor tags. 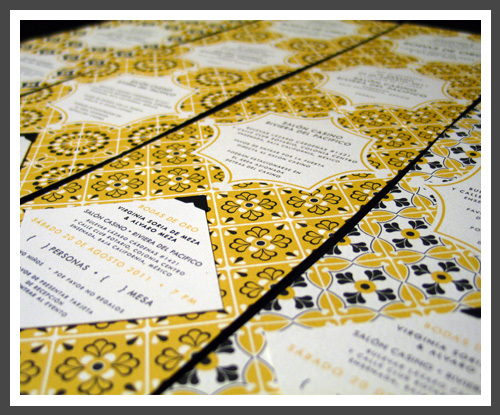 From the previous pattern designs four various background designs were created for the invitations, thus each guest would receive one out of four of the designs. 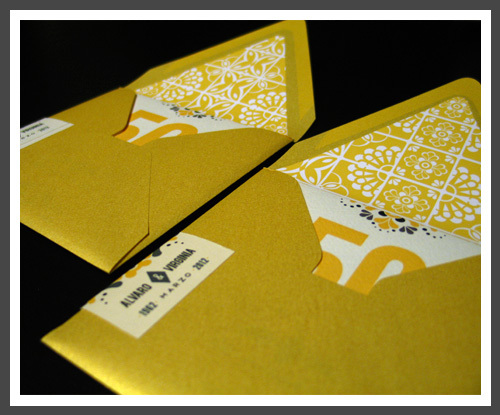 The format of the 50th Anniversary Invitation was long but folded down to a 5" x 5" square to fit perfectly in the gold envelope. 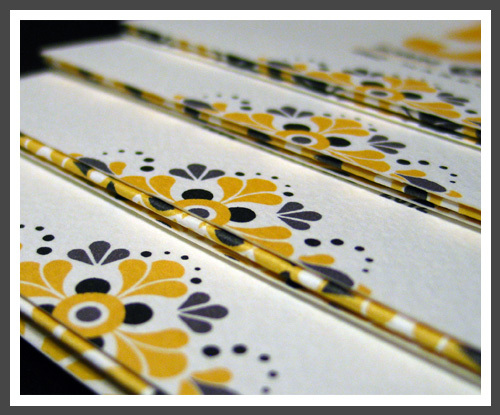 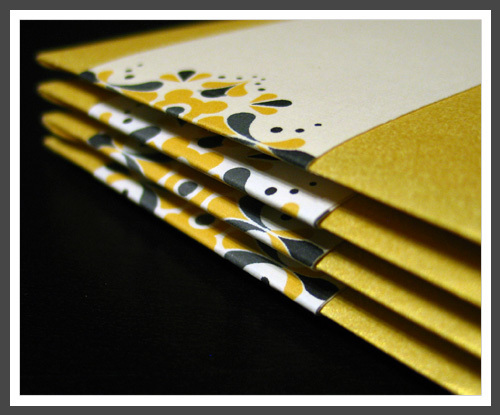 These are the four background pattern designs created for the invitations. 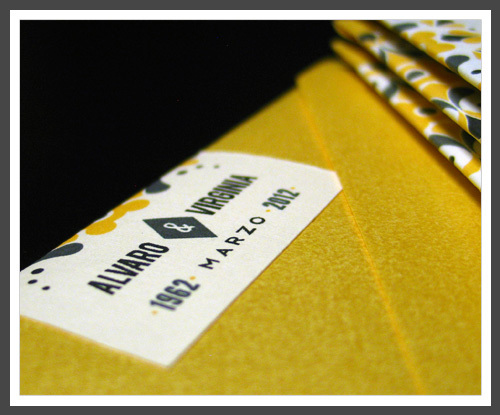 The colors were a mustard/yellow to match the gold envelope, accompanied by a rich black and accents of charcoal. 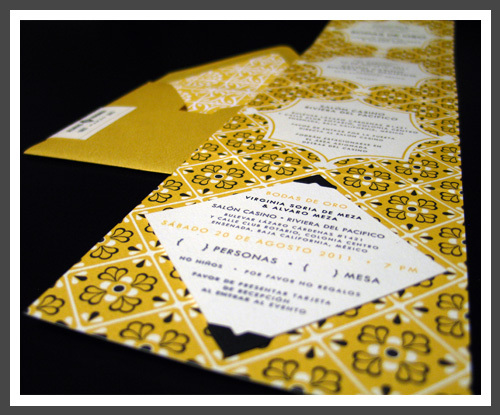 Flourishes were designed by taking elements of the various patterns to create a motif which accented the outside of the invitation as well as the address label below. 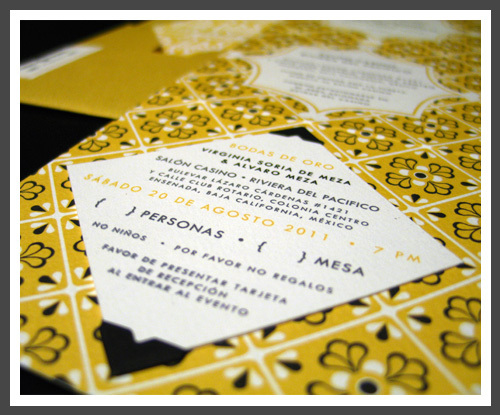 A crest shape contained the pertinent information for the event and was the unifying design element on all invitations. For the reception card, which needed to be removable, we used black photo corners to keep it in place. 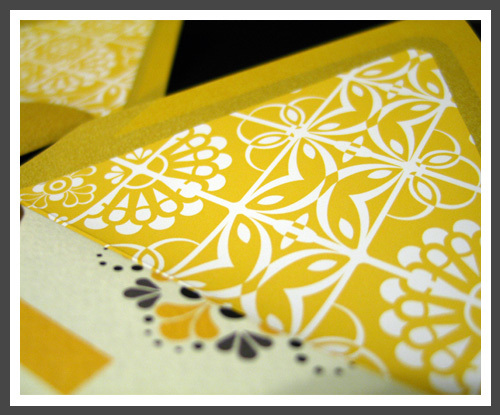 It worked out perfectly, fitting inside the diamond shape created by the patterned background. 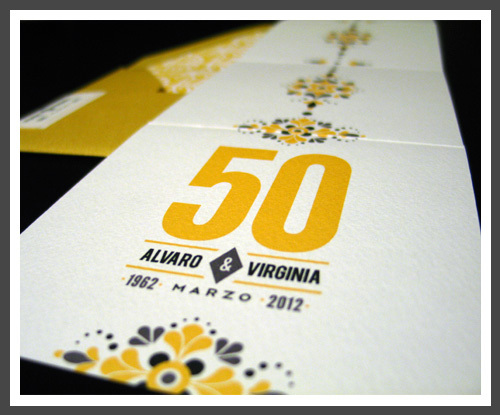 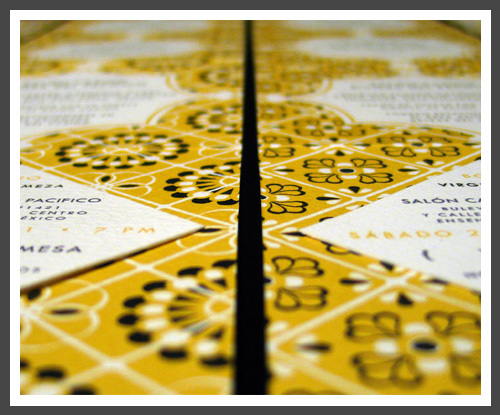 And the final touch to this 50th Anniversary Celebration Invitation were the two designs created for the envelope liners. 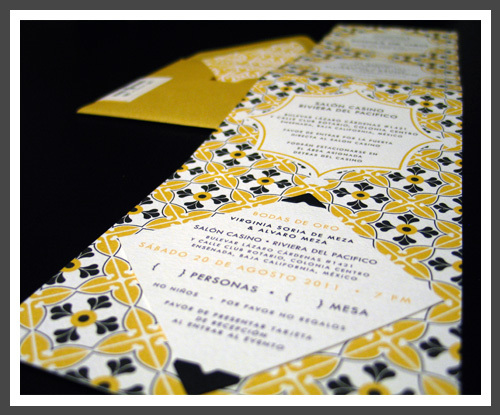 Taking a combination of motifs from all the patterns created, two versions of the the envelope liner were designed unifying all the pattern designs. 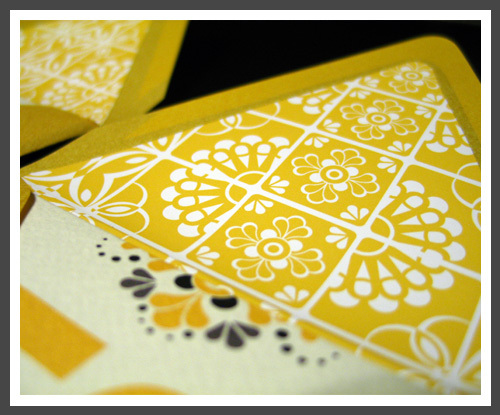 Thank you for your kind words, 'anonymous'! 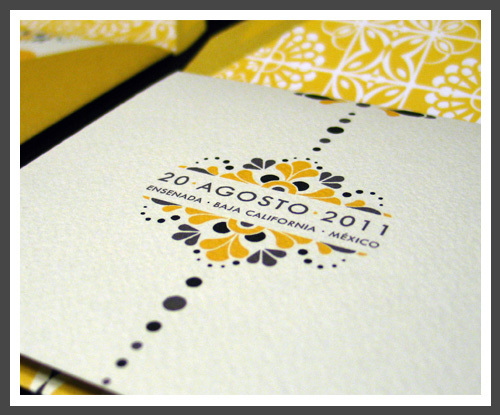 Make sure to check out our new website for more from the design collection!